Smart Water Metering Market size for 2016 was over USD 900 million and is set to reach over an annual installation of over 35 million units by 2024. Strengthening global initiatives and growing measures to reduce Non-Revenue Water (NRW) for efficient resource utilization will propel smart water metering market. Emerging sustainable solutions for effective management coupled with increasing efforts toward water conservation will augment the business growth. For instance, according to the American Water Works Association (AWWA) estimates, there are nearly 237,600 water line breaks per year in the U.S., accounting for over USD 2.8 billion annual revenue loss. Stringent government regulations to effectively monitor water distribution network along with precise assessment of the resource allocation will boost the market. Development of infrastructure to provide proactive services and streamlining the water supply management will further stimulate the industry outlook. In 2016, the U.S. government announced to allocate USD 37.5 billion to provide financial assistance to energy and water programs. Ongoing technological advancement for the development of precise and effective metering technologies will drive the market. Rising concerns pertaining to water scarcity and reduction of water wastage will further fuel the industry landscape. According to the Environmental Protection Agency (EPA), over 36 U.S. states are undergoing water scarcity crisis since 2013. Advanced Meter Infrastructure smart water metering market is anticipated to witness growth over 28% by 2024. AMI systems assist in streamlining the billing process by reducing labor costs and provides effective billing generation. For instance, Southern Water, a UK based distribution corporation announced that AMI venture is saving approximately 27 million litres of treated water per day in South and South-East England. Affordable maintenance, easy availability and low installation cost are some of the key underlined parameters which will encourage the product adoption over other available alternatives. AMR collects consumption, and diagnoses data automatically from metering devices and transmits that data to a central database for billing, analyzing, and troubleshooting. Residential market size is predicted to reach over USD 1 billion by 2024. Rising demand for accurate billing coupled with effective mapping of unregulated spending on water resources will positively impact the market. Ability of intelligent metering systems to reduce non-revenue water and secure remote monitoring will escalate its demand across residential establishments. Introduction of government incentives and measures toward reduction of Non-Revenue Water will propel the utilities smart water metering market. Shifting focus toward construction of smart infrastructure coupled with fundamental restructuring of water supply system will further facilitate the product adoption. Cold smart water metering market will witness growth of over 17% by 2024. These meters can be used up to temperature ranges of 300 C and find application across residential and commercial establishments. Ongoing increase in consumption coupled with rapid expansion of cooling pipelines will further embellish the product outlook. Hot meters will witness significant penetration owing to their precise technical sophistication and ability to effectively regulate individual water consumption archetype. These systems are designed for temperatures up to 1300 C.
UK smart water metering market is projected to witness strong growth on account of active regulatory regimes pertaining to environmental sustainability and consumption pattern. For instance, in the UK, a smart metering program has been carried out by Thames Water, a utility that plans to install smart meters for its customers across Thames Valley and London by the year 2030. Increasing water scarcity and growing consumer interest toward billing transparency will boost the U.S. smart water metering industry. Shifting trend toward digital economy coupled with economic merits of installation of accurate system will further embellish the product landscape. Government funding toward reduction of Non-Revenue Water and improving investment environment will enhance the industry landscape. In 2013, the American Recovery and Reinvestment Act (ARRA) effectively advanced the AMI installations in the U.S. and facilitated the development of water resource management across the country. Rapid urbanization coupled with rising concerns to effectively monitor water usage will fuel the Japan smart water metering market. Increasing efforts by manufacturers to develop technologies for efficient smart water metering will further enhance the industry growth. For instance, in October 2017, Huawei Japan along with Aichi Tokei Denki initiated technology verification of Narrow Band IoT (NB-IoT) for smart water metering with an aim to provide sustained & improved water supply. 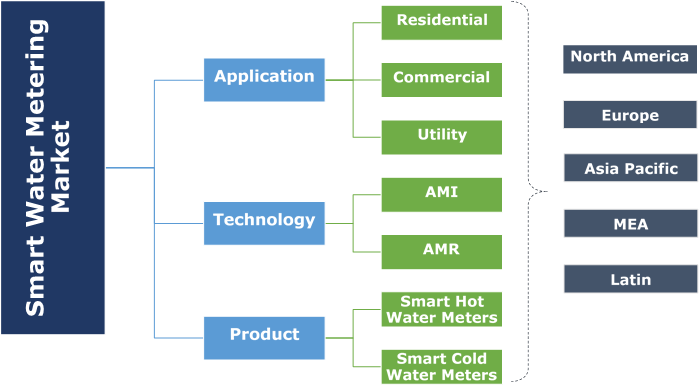 Notable smart water metering market participants include Diehl Metering, Apator, Siemens, Aclara, Badger Meter, Landis+Gyr, Honeywell International, Sensus, Arad Group, Neptune Technologies and Kamstrup among others. Price affordability, product differentiation, effective distribution network and regulatory conformance are some of the key strategic assets for manufacturers for securing a competitive position in the industry. Smart water meter is an integrated system that enables customers to effectively monitor and diagnose consumption patterns, identify maintenance issues and provide information to effectively track associated costs. These products can provide real-time communication, assess accuracy fairly and alleviate imminent global water scarcity.